You guys, our favorite people ever, may have noticed lately that we’ve had less than an ideal supply of certain beers. Even the beer that our Fulton location was built on - Falcon Smash IPA. How? Didn’t you guys open that huge new production facility? Well yeah.. but like anything else in life, its complicated and driven by many variables. To put it simply, all the outpouring of love we have experienced has literally overwhelmed our beer making capacity across the board. This includes draft beer to our favorite retail accounts and beer for onsite tasting room which contains packaged/crowler/growler fills as well. We could not be happier or prouder to have this “great problem to have” but it is an issue. So, as of the release of Nectar and Knife DIPA and Far From Dawn RIS, we’ve declined to allow those two beers to be taken from the brewery. All of which is and has been communicated on our website. The reason for this is simple, we need to be able to supply both of our tasting rooms with beers that we literally cannot make enough of. We aren’t thrilled that after cans sold out, we had to place this restriction since we have offered growler/crowler fills since the beginning. The need to keep our tasting rooms flowing with beer is entirely too important to us and is at the core of why opened the brewery to begin with. How are we addressing this situation? We’re ordering more equipment, installing/upgrading what we thought was adequate infrastructure, and most importantly we’ve hired some great people to help with beer making and serving. Also, you will notice an increase in experimental 7bbl batches brewed Downtown with a slight (for now anyway) emphasis on session strength styles and iterations with a deeply seated focus on overall drinkability – UK session ales, pale low abv lagers, etc. Expect at some point in the future to see the first offerings from our mixed culture fermentation program. We’re making more beer, but we will never rush into anything. Each day we are blown away at the amount of support we’ve received from all of you. Without that support, none of what we get to do every day would be possible. From the entire team, thank you. We’re excited to announce the opening, on Friday, December 16th, of our new brewpub in the Historic Fulton neighborhood of Richmond. We worked closely with Kathy Corbet Interiors to design a space that is influenced by and pays homage to the RVA art scene. We have 2 20ft communal tables spray painted by local artist Matt Betts and an 80x15 mural on one wall painted by Mickael Broth aka The Nightowl. We have acid stained tabletops designed by Small Axe Forge and signage by Foggy London Towne. As previously alluded to, we’re also launching this location as a brewpub (not just a tasting room), partnering with Billy Fallen for the food portion. Our partnership with the creator of RVA's Billy Bread was born out of a love for all things fermented, with pizza near the top of the list. Expect our pies to be heavily influenced by and in the vein of the Neapolitan style: thin crust, baked in roughly 90 seconds in our 1200-degree oven, with a delicate touch of leoparding lending an additional depth of flavor to the dough that was fermented roughly 24 hours prior to baking. These pies are designed and meant to be consumed in one sitting without weighing you down. Our pizzas are made using 00 Italian flour, Italian tomatoes, fresh mozzarella, and locally sourced Sausage Craft meats. Our Hatcher St. location in Fulton features a 20bbl brewhouse with 40bbl fermenters. 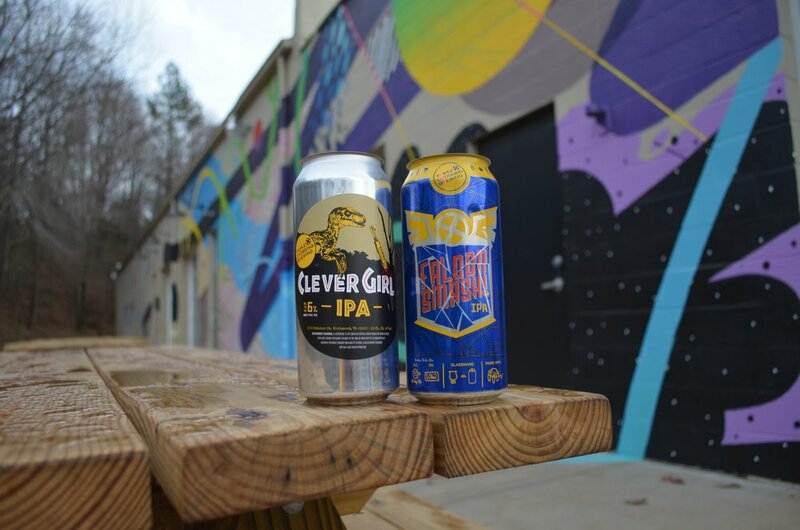 It will give us the ability to produce significantly more of some of our most popular brands such as Falcon Smash IPA, Nectar and Knife DIPA and Clever Girl IPA. We’ve been working on perfecting these brands and others for several years over at our Foushee location. We hope to be able to increase our footprint so that more restaurants and bars in the area can carry our beers, if they wish. We also look forward to releasing cans semi-monthly in the brewery as well as out to market at local bottle shops. This location’s size also gives us the ability to start a barrel storage program which is already underway. We’ve purchased red wine barrels from our friends at Pollak Vineyards to begin a mixed culture fermentation program which we’ll release in bottles some time down the road. Our Downtown location at 113 S. Foushee St. will remain open indefinitely and will afford us the opportunity to produce significantly more one-offs than we’ve been able to make up to this point in time. Our hours at the new location will be Tues-Thurs 4-10p, Fri-Sat 12-10p and Sun 12-8p. We are very excited to announce that Triple Crossing Brewing Co. has purchased a property located in the Greater Fulton Community. The site has a great view of the Richmond skyline and sits on just over 4 acres. The 30,000 sq foot building will allow us to grow our production output while providing a unique tasting room and outdoor experience. We plan to focus on providing fresh draft and can beer to the market from this location, beginning with our mainstay, Falcon Smash IPA. Our tasting room at 113 S Foushee St will remain open as we provide offerings at both locations. The Fulton Community is an area of the city that we feel has unmatched growth potential, and we can't wait to share our vision for the property. We evaluated a number of areas with the help of Jones Lang LaSalle before deciding on this building. The financing for this project is aided predominantly by First Capital Bank (now Park Sterling) and counsel provided by LeClair Ryan. Richmond continues to be nationally recognized as a great destination for its history, food, beer and uniqueness as a river city, and we hope to continue helping that recognition grow by making a significant investment in this fast-growing Fulton community. There have been a lot of friends that have helped us get to this point and we are forever grateful for them. The support of the Richmond community has been unbelievable and we cannot wait to help be a part of the Greater Fulton Community. Our incredibly sessionable amalgamation of an American Blonde/British Golden Ale has undergone a significant change for those that have a gluten intolerance – and basically zero change for those that don’t. We decided to try a relatively new product to reduce gluten levels in our summer ale after an integral member of our team found that his gluten intolerance reached a level that forced him to stop drinking beer altogether – unacceptable in our eyes. Given that Element 79 is nothing more (or less) than 100% Pale Ale malted barley, we’d hoped this stuff would work its magic. Sure enough, after a completely normal fermentation and normal everything else for that matter, we were left wondering what if anything actually happened. The beer seemed like its old self, no changes… until we had our aforementioned guinea pig give it a shot – via two 16 oz pints. Zero. Issues. But please be aware of the following: 1) the beer was made from a grain that contains gluten; 2) there is currently no valid test to verify the gluten content of fermented products; and 3) the finished product may contain gluten. Needless to say, we’re thrilled he can enjoy his favorite beer again, and we couldn’t be happier to offer this beer to those with any sort of gluten intolerance, in the hope that they can once again enjoy barley based beer. First time ever kettle souring, first time ever using lacto, and first time ever using the classic Dupont strain for primary fermentation. Given all of those firsts, you’d think we’d have at least eschewed at least one of those variables to make things a little “safer”. Nah, at 7bbls at a time, we can afford to let our hair down pretty much whenever we want, and so this beer was born. After deciding that we wanted to try kettle souring for ourselves – a process by which a kettle full of wort is intentionally pitched with souring bacteria/bugs and then left for a specific period of time to sour, and then subsequently boiled thereby killing the bacteria but retaining the tartness and acidity achieved prior to the boil. The strong side of this method is that it helps to lower the risk of infecting your post boil/fermentation equipment. The possible downside is that generally speaking, the flavor profile gained from such a quick method is often not quite as complex as beers soured during traditional maturation process. It definitely matters what you want the final beer to be. For this beer, we were after a bright, dry, highly drinkable lemon like tart blonde farmhouse style ale. We wanted a noticeable ph drop in the pre-fermented wort that would lend an acidic almost citric acid profile to a saison yeast forward beer. So, our friends at RVA Yeastlabs were contacted and a pitch of RVA600 Lactobacillus went into the kettle after chilling it down to the lacto friendly temp of ~107F and then left to sour overnight…hopefully. Sure enough, the next morning we found the ph of the wort dropped significantly and the acidity present was both noticeable and pleasant. We proceeded on with the boil as usual and for the sole hop addition, tossed in just under a 1lb/bbl of US Cascade in the whirpool to lend even more impressions of citrus. The beer was fermented with a fresh culture of RVA Yeastlabs RVA 261 Saison 1 with zero temperature control. We think we’ve made quite the summer beer at 5.5% ABV, with a soft, dry, doughy wheat derived mouthfeel, and a brite lemon like tartness that melds right into the typical Dupont yeast derived fruit like esters, and less so of the usual phenolic clove and spice character. We’re quite pleased with our shot in the dark, and we hope you enjoy it too. It’s been a year since we opened our doors to RVA and to say it’s been great is an understatement for sure. We have been incredibly well supported and watched our vision and goal for this brewery take shape and become an actual thing. Pretty surreal honestly. Anyway, our 1st Anniversary weekend is upon us. Open at 4pm with Propane BBQ Food Truck and the Cary Street Ramblers taking the stage at 7pm – Double Falcon Smash Release – the love for our first ever raptor continues with this double IPA that follows the blueprint of Falcon Smash IPA– slightly more malt, lots more dextrose, topped off with an obscene poundage of double dry hops, and potently fresh. 8% ABV, 90IBU draft and growler fills only. 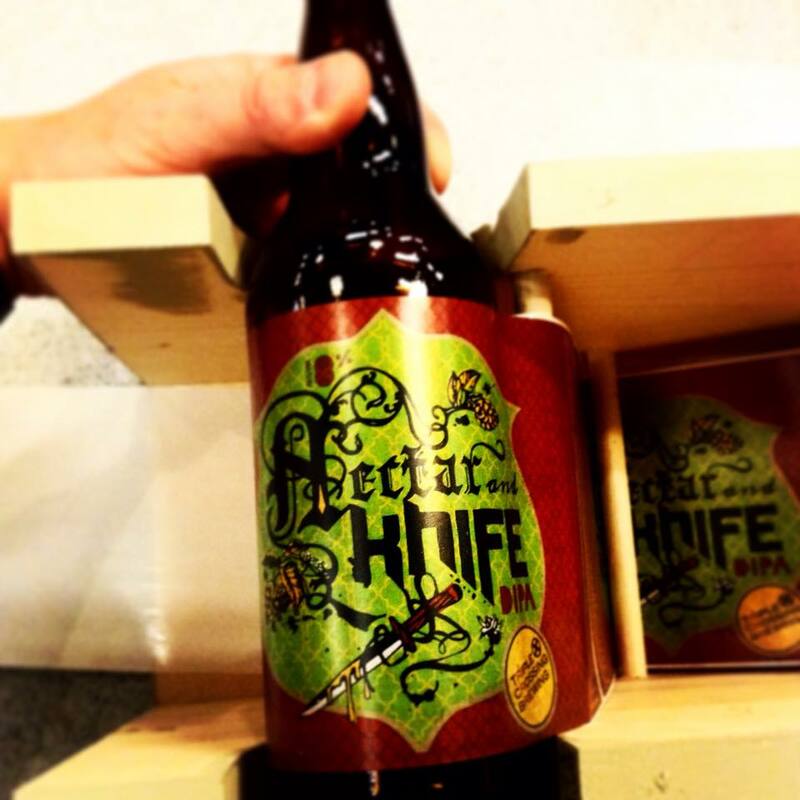 Saturday April 11th 12pm-10pm – Nectar and Knife DIPA 22oz bottles and draft. 1st Anniversary Ale - Saison Brett bottle only release, and a seperate Brett Saison – single hop draft only tapping at 2pm. Cultured Swine and Sausage Fest will be serving up food. Boxwave plays at 7pm. Wrist bands – all patrons over 21 wanting to consume onsite beer (no bottles, no growlers) will be greeted at our front door on Foushee Street to have their ID checked and wrist band issued. Bottles – Nectar and Knife DIPA, Liberty or Death Porter, and Saison Brett bottles will only be sold at this table starting at 12PM. Each bottle type has a strict 4 bottle per variety per person limit. No sales of any kind at the bar – beer tickets exchanged for draft pours only. No tasting samples or flights either, as this significantly slows down our ability to serve everyone. The whole objective of this post and the Anniversary Party is to make the experience rule as much as possible, and to make it as efficient as possible for you great people to get a beer. This beer has been in the bottle for ~ 8 weeks. While the brett character is beginning to show itself in the flavor, aroma, and slightly increased carbonation levels – this particular beer will continue to evolve over the course of several more months depending on what level of brett character you enjoy. More time at room temp will draw out more of that signature brett charm as it goes through fermentation under the stress of bottle conditioning. Can’t wait to see you all next weekend and thank you for all of the support. 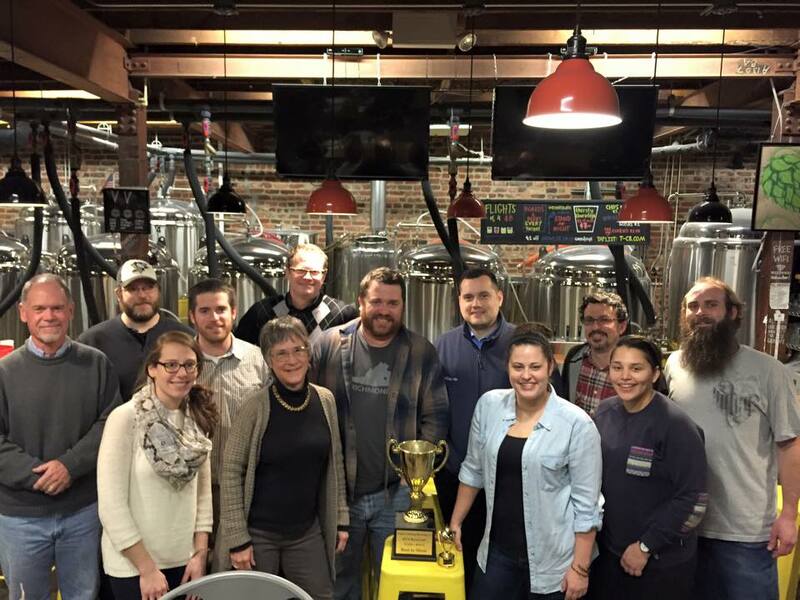 RVA BrewCraft 2015 is our first ever homebrew competition at Triple Crossing. It started off as just an idea of something we would have loved to have done when we were home brewers. Since our brewing system is so small, it’s very easy for us to do one-off recipes, and we thought, "wouldn’t it be great to let the winner of this contest brew on our system?". So we had a logo designed and threw it all out online thinking we’d have just a few entries for the first year, but with the goal of making it an annual thing with hopefully more and more people each year. But man, did this thing take off. We had over 70 entrants and even more beer (each person could contribute two bottles). Thanks to the support of our homebrew community, homebrew shops and clubs alike, the awareness was built around the city and we quickly had a very crowded contest. The great support we received from Artisans Wine and Homebrew, James River Homebrewers Club, Original Gravity Homebrew Supplies and The Weekend Brewer helped bring in a huge quantity of beer. We quickly realized that the three of us couldn’t judge this on our own and reached out to the local Richmond community for some help. Some of the TCB staff and other friends graciously volunteered their time and we received help from other RVA beer celebrities that did even more to raise the legitimacy of the event. We are so grateful to the judges who donated their time to come out and taste all of this beer and help us pick a winner. It can’t be stated enough how often the judges in the room were taken aback at the talent of the homebrew community in Richmond. We were all constantly impressed with the different beers we were tasting. Starting out as a homebrewer, I’ve certainly had a lot of it in my day and I can honestly say that most of the entries we tried were up there with some of the best I’ve ever had. I would put Richmond’s homebrew up against any other club in the country. It was a very tough decision, but we can’t wait to announce the winner and have them brew with us at Triple Crossing! The aroma of patented trademarked proprietary etc. hops are a catch 22 if there ever was one. They tend to be amazing, and therefore amazingly harder to find. What’s a new startup brewery to do prior to their hop contracts starting in Jan. 2015? Anything and everything they can. We’ve got a serious passion for Simcoe here at TCB, and that’s great, apart from the fact that Simcoe is one of those tough to find hops. After some searching we found some Simcoe and her daughter, Mosaic and given our recent trials with Mosaic, the decision to use these two hops was an easy one. Simcoe has long been a classic new world dual purpose hop that has some serious orange, pine, and dank character depending on where it was grown and how it’s used. Mosaic, a newer variety and from the parentage of Simcoe burst onto the hop scene with its sometimes blueberry like, tropical, citrus dank character. These two hops used together and throughout the late kettle, whirpool, and two dry hop additions bring a juicy tropical blueberry pine resin laced DIPA. The malt bill, if you can call it one, is a mix of pils, pale ale, domestic 2 row, a touch of munich, and a ton of corn sugar to keep the beer nice and dry. This mix of fermentable sugars lays down a nice clean background for the hops to pop off of, and is in no way balanced with the hopping rate. Its overshadowed, and done on purpose. We’ll have a limited run of 22oz bottles available for purchase at the brewery, draft, and growler fills as well. Come and see us on 12/13/14 for our last DIPA of the year. Mexican Chiapas cold brewed coffee… pumpkin spice… super sessionable dry stout. Although that about sums up a ton of firsts for us – first coffee beer, first dry stout, first pumpkin beer – we figured this beer could use a bit more waxing of the poetic. Our initial idea of even brewing a pumpkin beer was kicked around for a bit and from the onset, we decided that we’d try to make something different in general, and something very different for us. The idea of a pumpkin spiced latte, but in beer form seemed to work, as an idea anyway. A somewhat dry moderately roasty stout at 5% ABV to give the impression of roasted coffee and to keep the beer pintable. Then, we’d use a modest amount of pumpkin spice in the whirpool (1oz/bbl) to let the spices steep hot prior to chilling. Last, but certainly not least, we reached out to our friends at Black Hand Coffee Co. to get their input on what/how/how much etc. of coffee should go into the finished beer. Clay from Black Hand thought that the Mexican Chiapas coffee varietal, with its smooth chocolate tones, would work well with the base beer. Together, after scaling up the amounts, we arrived on 15lbs. of beans cold brewed for the 7bbl batch. The cold brew was added to the tank and gently mixed via co2, the wait began. After a few days of allowing the beer and the coffee to meld together, we poured some samples and hoped for the best. The aroma of coffee and pumpkin spice work well together, letting you know Fall is here. The beer is malt sweet, pumpkin spice and chocolate coffee, while finishing dry, definitely a more than one pint beer. Come and find out for yourself this Saturday 10/25/2014 where release this beer coinciding with our event benefiting the World Pediatric Project, a highly worthy cause. Come on out to the tasting room on Sunday, 10/5/14 as we release our newest IPA, Quiet Storm. This beer is a collaboration with Tony Ammendolia at Original Gravity Homebrew Supplies and promises to satisfy any hop-head! Quiet Storm can be described as a tropical citrus fruit forward heavily aromatic IPA brewed with our friend Tony from Original Gravity. At 7.0% abv and hopped accordingly with Mosaic and Amarillo, this beer is intensely flavorful, and lacking in any harshness. The collaboration for this IPA was so intense that we broke the paddle. We will be open an additional two hours to allow Junk Function to grace the tasting room with their Jazz-Rock/Funk sounds in support of their new EP Cardinal Directions. Well, this has certainly been a long time coming. There’s been quite a bit of that feeling going on lately for the Triple Crossing Brewing Company. My initial idea with this blog was to document, catalog, and generally let everyone inside the juggernaut of activity required to open a brewery, even for one of our size. And so that didn’t happen. I have to admit, I felt bad about it, and swore I’d get to it “next thing”. And then that didn’t happen. So, here we are, open for business and after a stellar opening week by our estimation, and maybe feeling like we can settle into running the brewery and tasting room without the added mess of getting the whole thing open. And let’s not forget, the beer. Sure enough, RVA hearts hops. You all finished off our first ever IPA aptly titled Falcon Smash pretty briskly, and for that we thank you. Getting that text message was pretty great. - we lightened the color of the newest batch just a touch, down from a deeper orange or medium straw – if that makes sense. This version is still super dry, in fact the slightest bit drier than the previous FS. - we changed the yeast strain from our English Ale strain, to a cleaner and higher attenuating American Ale yeast. - we elected to omit the New Zealand Motueka hop from the beer altogether and went instead with 100% Falconers Flight in the late kettle and double dry hop. What all this means, is that although this beer certainly flies in the spirit of Falcon Smash, they are different beers and you should expect some differences between the two. When we envisioned this place, we fully intended to experiment, tweak, mess with, and try anything we deemed fit to create better and more interesting beers. This brewery was born out of experimentation and will continue to thrive on that, even if it means a little risk taking. So what does all this mean again? Try the beer, and tell us what you think. Should this beer be Falcon Smash or should the first version, or both? We’re brewing the beer, but we’re also watching and listening to what you’re drinking… I mean, just not in that way though.